When EQuIS Alive is installed, the Alive-refvals.xsd format installs by default to \Program Files\EarthSoft\EQuIS\Formats\Alive. These reference tables listed above can be exported from an EQuIS database via the RVF Builder Form. Simply export one or more of these reference tables and save as an .xml file by following the steps in RVF Builder. The .xml file can then be loaded in another database as an EDD in EDP using the Alive-refvals.xsd as the Format. Follow the steps in Reference Values - Importing for more information on using the Alive-refvals.xsd in EDP. 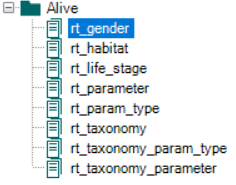 Single rows can also be entered manually into the reference tables seen in the image above, which will then appear as Available Parameters in the Alive Survey Definition Form. Note that the Alive-refvals.xsd format is not meant to be opened in EDGE.